I don’t know if it’s possible to have too many cherry tomatoes. But if you do, roasting them is the perfect way to eat a whole bunch at a time. They shrivel up into the sweetest, tangiest little bites – which are perfect to toss into simple bowls full of greens and grains. 1. Use little tomatoes and it’ll go tons faster. 2. Start roasting them in low heat (like you’re supposed to). Once they begin to dry (and your impatience rises), raise the temp. At the beginning of the week I like make a big batch of some kind of grain – this time it was chewy wheat berries. Store them in the fridge and they’ll be ready to use for meals like this. I added spoonfuls of creamy sun cheese (a creamy sauce made out of sunflower seeds – also another a make-ahead item). 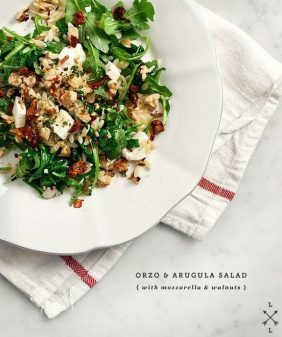 Some burrata or fresh ricotta would go nicely in here as well. Preheat oven to 200 degrees F. Slice most of the cherry tomatoes (leave some whole if you want) and toss them with a bit of olive oil, salt, and pepper. Place them cut side up on a baking sheet lined with parchment. Let them slow roast for about 1 hour, then turn the heat to 300F for another 20-30 minutes or so. Oven times will vary so check them periodically. Add fresh thyme to the baking sheet during the last 10 minutes or so. Meanwhile, cook your wheat berries in boiling salted water until tender and chewy (about 30-40 minutes). Drain and set aside. Meanwhile, make your sun cheese. Chill until ready to use. Optional step: cook chickpeas (with a little olive oil, garlic, and salt) in a skillet until they're lightly browned. 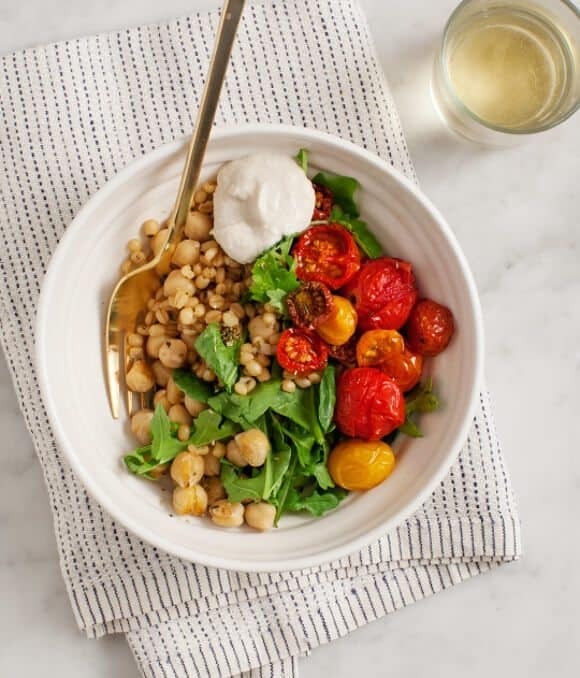 Assemble bowls with wheat berries, a few greens, roasted chickpeas and roasted tomatoes. Sprinkle with thyme leaves and/or other fresh herbs. Add a dollop of sun cheese (or other cheese) and dig in. note: steps 2 & 3 can be made day(s) in advance. I usually don’t like those little tomatoes, but when they are so fresh like this time of year, I love them!! I agree – I’m picky about tomatoes – local in-season ones are definitely the way to go! Your timing is superb! I was just thinking to myself, “I need a good tomato salad to go with dinner tonight” and then…BOOM! This post showed up on BlogLovin’. A quick run to the store and I’m all over it. There’s nothing better than roasted cherry tomatoes in the summer. And I’m loving this grain bowl! love the idea of sun cheese, never heard of it..and roasted cherries are so delicious. it’s pretty much like cashew cream, just with sunflower seeds! Look so delicious, healthy and different, yummy ! thank you for the great recipe, really inspiring. Roasted cherry tomatoes is the main reason I love summer!!!! This is exactly the kind of no-fuss dinner I’m enjoying right now. 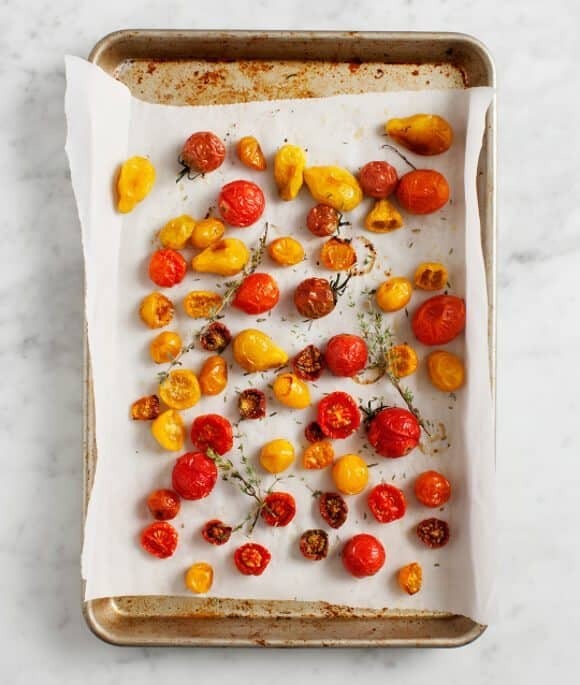 I’m crazy about slow-roasting cherry tomatoes. We had so many from the garden last year that it was the only way to stay on top of them. Looks delicious and perfect for summer, love roasting tomatoes! This is totally my move with cherry tomatoes, too! They are so good roasted. One question – why are you supposed to roast them at a low temperature? I guess I usually roast them around at least 350. They dry out and the sweetness really concentrates, so they taste more like sun dried tomatoes. (Except for the ones that I left whole here – those stayed juicy obviously). Give it a try sometime! The nice thing is that at the low temp they don’t have to be watched all that closely. Very good to know. I’ll try this next time. Thank you! I’ve never had roasted cherry tomatoes! 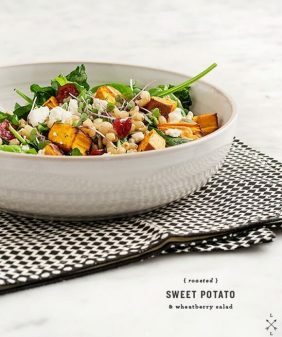 That sounds amazing 🙂 Love the use of wheat berries here, too! 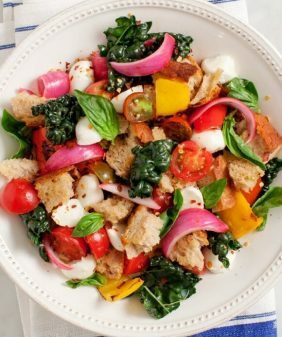 I love roasting tomatoes – this salad looks awesome! I love making slow roasted tomatoes, but they do take a very long time, your shortcut is a great tip! I’ve also been addicted to cashew cream lately, your sun cheese has me intrigued…and I just can’t go without saying how GORGEOUS all your photos are, we do eat with our eyes and your pics make me want to eat everything! Thanks for all the inspiration. Beautiful photos. And I’m a big fan of your “cheating” method! I made this tonight, and it was incredible! So simple and delicious. I loved how all the flavors complemented each other. Thank you! oooh so glad you liked it! Just made this for dinner and it was delicious! What a great idea! The sweetness of the tomatoes is fantastic. 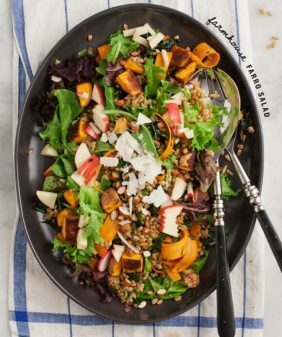 I modified it a bit by using red quinoa instead of wheat berries, added lemon zest and juice to the quinoa, and added a little heat to the chickpeas with some red pepper flakes. Made a fabulous meal! We are about to have a ridiculous amount of cherry tomatoes ready to harvest from our veggie garden. Can’t wait to try out this recipe with them! BTW have you read A Homemade Life by Molly Wizenberg? 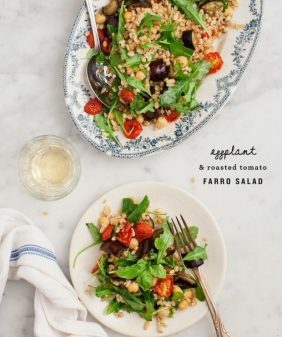 There’s a wonderful recipe in it for slow-roasted heirloom tomatoes. LOVE! Mmmm, roasted tomatoes are like candy this time of year. 🙂 These bowls sound wonderful! This is the perfect dish for all the cherries tomatoes we have. Can’t wait to try it! 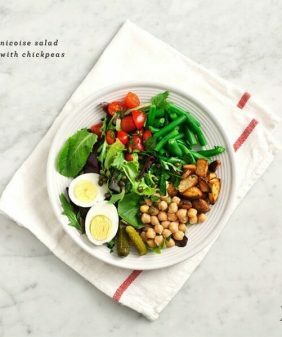 this is seriously just the perfect salad meal, definitely one i will be recreating in my kitchen. thanks for the idea! I just made this for lunch, and it was delicious!! I loved the combination of textures and the fact that it was so simple, yet those roasted tomatoes really made it special. I used ricotta, which was a nice bit of richness. I’m so glad you liked it – thanks for sharing! Thank-you for this recipe! It is so delicious. I’ve made it a # of times since the original post! Looks so lovely. How many calories per serve?